Wax and polishes are used for many purposes. Wax has their principal use in waterproofing; they are mainly consumed industrially as components of complex formulations, often for coatings. Waxes confer matting effects and wear resistance to paints. Although most natural waxes are esters, paraffin waxes are hydrocarbons, mixtures of alkanes usually in a homologous series of chain lengths. These materials represent a significant fraction of petroleum. They are refined by vacuum distillation. 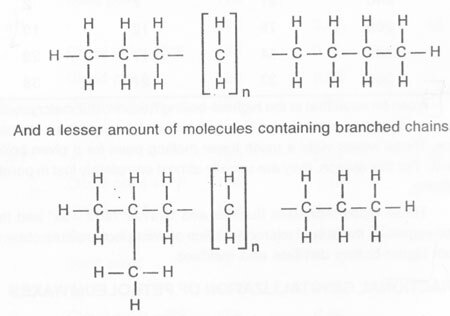 The degree of branching has an important influence on the properties. Millions of tons of paraffin waxes are produced annually. They are used in adhesives, in foods (such as chewing gum and cheese wrapping), in cosmetics, and as coatings. Paraffin wax is typical of the agents that are coated on a film or sheet, one that really melt. Waxed paper, still the most widely used heat sealing material, was the earliest product to bring the advantages of heat sealing to packaging. Paraffin wax is mostly found as a white, odorless, tasteless, waxy solid, with an average melting point. The FT waxes are purely synthetic polymers of carbon monoxide and hydrogen which can be best be described chemically as mineral waxes. Duroxons of the B group also serve as additives in the manufacture of lubricating greases for the purpose of raising their dropping point and improving the consistency. There are various types of mineral waxes; lignite wax, montan wax, durmont wax, ozocerite wax, utah wax, peat wax etc. Utah waxes are successfully utilized in dance floor wax, linoleum wax, shoe polish etc. Some other important uses of waxes are in candles, polishes, electrical insulation, coatings and carbon paper. There are various types of polishes having industrial and domestic applications; abrasive polish, aluminium polish, motor car polishes, cellulose friction polishes, furniture polishes, leather belt polishes, pine oil metal polish etc. For many years, petroleum wax was considered a byproduct of lubricant base stock production, it has come onto its own over the last decade and is considered by most refiners to be a relatively high margin product and is often an important contributor to the overall profitability of the refinery. Pure paraffin wax is an excellent electrical insulator. There are many refineries in India which have with fuel, lube, wax and petrochemical feed stocks production facilities. Mineral waxes (including petroleum) account for an estimated 85% of this global demand, with synthetic waxes accounting for 10% and animal and vegetable waxes, accounting for 5%. Wax consumption is expected to grow at an average annual growth rate of 1% in this decade. Clearly, different regions and different product applications will enjoy different growth rates. This book basically deals with microcrystalline waxes in floor polishes, properties of braxilian grades of carnauba wax, compatibility of paraffin waxes with other substances, synthetic mineral waxes, miscellaneous synthetic waxes, additives for raising melting point of candles, wax coating for fruits, shribs, and plants, effect of paraffin on esparto montan mixtures, water proofing of kraft papers, production of montan wax, polish, abrasives, metal cleaners, nickel silver castings, cleaning, polishing metals for metallographic analysis, paste for wax calf leather, burnishing polishes for automobile maintenance, etc. The purpose of this book is to present comprehensive information of different types of wax and polishes like their processing, properties and uses. This book is very useful for new entrepreneurs, technocrats, professionals and researchers. Polish for Silver, Nickel, Brass, Chromium, etc. Melt the "A-C" Polyethylene and add the oleic acid, avoiding overheating. With the melt temperature at 248-266Â° F., add the morpholine. (Care must be taken to prevent boiling out the morpholine.) There is a sufficient excess to allow for minor evaporation. Avoid open flames since morpholine has a flash point of 100Â°F. While "A-C" Polyethylene is being melted, heat the water (bring to a boil and turn off heat just before using). With rapid stirring (but below speed at which air is whipped in ), slowly add the melt to the water (1-3 minutes). During the addition, the temperature of the melt should be 239-257Â°F, and the water 203-210Â° F. (not boiling). Add the melt at a steady rate to the top of the vortex formed by the stirring action (the melt stream should not hit the beaker side or the stirrer shaft). With proper addition the melt will spiral down the vortex and be emulsified enroute. If stirring speed is too low or rate of addition too high the melt will accumulate in the vortex and impair the quality of the finished product. Cover, and with moderate stirring allow to cool to 104-122Â°F. Make up to weight to replace loss of water due to evaporation. Melt the polyethylene in the oleic acid. Heat to 212-230Â°C. and add morpholine slowly with stirring. Hold temperature at 208-210Â°F, add water (heated to 100Â°C.) slowly with rapid agitation. Cover and stir until 104-122Â°F. Add water to make up to 184. "A-C" Polyethylene 629 may also be emulsified with potassium or sodium soaps. Borax may be used in combination with amine soaps. Several formulations are included in the following pages to illustrate some of the ways "A-C" Polyethylene 629 may be used. Many variations will be immediately apparent to the experienced formulator. However, it is strongly recommended that the basic laboratory emulsification procedure described in the preceding section should be tried before modifications are made. "A-C" Polyethylene 629 in combination with a resin and a leveling agent gives a dry-bright floor polish which has high gloss, water resistance, and exceptional durability. The formulations using "Ubatol" 2003 as the resin and "Durez" 15546 as the leveling agent are suggested as high quality industrial polishes. The emulsions and solution are prepared separately to 15% total solids and blended. Mix together at room temperature the dibutylphthalate, "KP" 140, and the "Ubatol" 2003. Stir the mixture moderately for one-half hour. Then add the water and stir a few minutes. Heat water to 185Â°F., add one-half of the ammonum hydroxide, and with good agitation add the "Durez" 15546. Temperature should be maintained at 185-190Â°F. Add the remainder of the ammonum hydroxide and stir until solution of the "Durez" 15546 is obtained. The following are the polish proportions. The finished product is obtained by blending the desired amount of leveling solution with the wax emulsion. Recommended proportions are 25 or 30 parts of leveling solution to 75 to 70 parts of emulsion. For greater water resistance ammonia cut resins may be used. Best leveling and gloss in this formulation are obtained with borax cut resins particularly "Shanco" L-1001. These proportions may be varied considerably to bring out the qualities most desired by the formulator. Increasing the A-C Polyethylene emulsion improves polishability and film flexibility. Increasing the resin and the leveling agent improves the hardness and dirt pick-up. Excellent leveling is attained with these three components over a wide range of proportions. Melt wax, resin and oleic acid with agitation until all the resin is dissolved. Cool to 257Â°F. Add morpholine and hold at 257Â°F. Add wax mixture at 257Â°F. with agitation. Agitate while cooling to room temperature. Add 70-80 parts of the wax emulsion to 30-20 parts of the leveling solution. The following formula is representative of a good, high Shellac type dry-bright polish containing "A-C" Polyethylene 629. In the heated kettle, raise the temperature of the water to 160Â°F, and add the borax with stirring. Continue stirring and heating and add the shellac in granular form. Stir until solution takes place, cool the bath and make up to weight for loss of water due to evapoation. Heat water to 194Â°F., add the borax with agitation until dissolved. Maintaining the temperature at 194Â°F., add the Shanco resin and stir until the solution is achieved. Melt the waxes, "A-C" Polyethylene 629 and resin at temperatures up to 350Â°F. cool to 250Â°F and add the oleic acid with agitation. When the temperature reaches 205 to 210Â°F., add the KOH and borax (no borax in formula 2) in a hot saturated solution followed by the TEA. Cook for 20 minutes at 205 to 210Â°F. (for formula No.2, add the KOH solution and cook for 15 minutes; add the morpholine followed by the ammonium hydroxide with equal parts of hot water, and cook for an additional 5 minutes). Pour the wax-mix (205-210Â°F) into one half of the water at 205 to 210Â°F. with rapid agitation. Add the remaining water (cold) while cooling to room temperature. These formulations should be free from scum and sediment. Formula No. 2 will have excellent water resistance; and both formulas will give very high gloss, good buffing properties, good slip resistance, and long wear with a minimum of discoloration. Excellent leveling can be obtained with 20% of a leveling resin solution. These formulations are stable at high solids concentration and will have good stability with high concentrations of leveling resin. "Ubatol" polystyrene can be added to these emulsions with good results. Melt the waxes, "A-C" Polyethylene 629 and oleic acid together and bring the temperature to 205 to 210Â°F. Add the morpholine followed by the borax in a hot saturated solution with agitation. Begin adding half of the water (205 to 210Â°F.) slowly until the emulsion inverts to the "oil in water" type. The remaining hot water and cold water can be added to a rapid rate. Cool to room temperature with slow stirring. Heat the wax, silicone, mineral spirits and "Ethomeen" 18/12 acetate until the wax melts. Add the water to the wax very slowly at first with stirring. Then add the remainder of the water while continuing agitation. This formulation dries with a good gloss which upon buffing takes on a high luster. A steam-or hot-water-jacketed kettle is preferred for making wax polishes, as a satisfactory temperature must be maintained to prevent caking of the wax along the sides of the kettle and to avoid discoloration by overheating the wax. A paddle-type, hand-operated stirrer or a low-speed, large-bladed propeller is also suggested for successful operation. Since morpholine has a flash point of 100Â°F., it should no be added to the mixture in the presence of open flames. If the wax is melted by means of a gas burner, the gas should be turned off during the addition of the morpholine. Melt the waxes and stearic acid, add the amine, and maintain the temperature at about 90Â°C. Add the naphtha slowly and stir until a clear solution is obtained and the temperature is 90 to 95Â°C. Avoid the use of open flames. The method of adding the abrasive depends on the type used. An oil-absorbing abrasive, such as tripoli, should be well mixed with the hot naphtha solution of waxes just before the water is added. An abrasive that absorbs water, such as bentonite, is best stirred into the finished emulsion. Heat the water to boiling, add it to the naphtha solution, and stir vigorously until a good emulsion is obtained. Continue stirring slowly until the emulsion has cooled to room temperature. The proportions of waxes can be changed as desired, depending on the ease of polishing required and the hardness of the final film. A high-melting hydrocarbon wax can be used in place of all or part of the beeswax with good results. When the primary use of the automobile polish is for polishing rather than as a cleaning and polishing combination, it will be more satisfactory without an abrasive. Heat the solvent to 180Â°F. and add the molten waxes. Cool with stirring and pour into containers at 100 to 140Â°F. Do not stir rapidly when the mixture approaches the pouring temperaure. Rapid agitation will affect the crystal formation adversely and may cause separation of the solvent. Add the melted wax to water. Mix 80 parts of a with 20 parts of b. Mix 50 parts of a with 25 parts of each b and c.
Add the melted wax to the water. Mix 60 parts of a with 40 parts of b.
Gel -point : Less than -4Â°F. Gel -point : Less than 14Â°F. The Waxes are melted together at a temperature of 212 to 225Â° F. While agitating strongly, the mineral spirit, respectively the blend of mineral spirit and turpentine is slowly added in a steady stream. Then the heat is shut off and agitation is continued while cooling the mass to room temperature. Where "FT" Wax 300 is part of the formula, the waxes are heated in the presence of approximately 20 to 30% of the total quantity of solvent until a clear solution results. For this purpose temperatures of approximately 200 to 212Â°F. are recommended. Only when such a clear solution is achieved. the balance of solvent is added. This procedure can be recommended as a matter of general practice in order to prevent any separation of wax components or premature crystallization. Products with a higher viscosity can be obtained by adding "Duroxon" J-324 to the composition. A further viscosity increase can be obtained without change of solids content if, in the place of mineral spirits fresh spirits of gum turpentine is used. When blends of turpentine and mineral spirits are used, the viscosity depends on the proportion of turpentine. Small quantities of nonionic emulsifiers may be added to liquid solvent wax formulations. Such emulsifiers prevent agglomeration of crystalline particles and improve gel-formation. Emulsifiers of the type "Igepal" CO-880, 'Emulphor" ON-870, "Hoechst" 2106, "Atlas" G-3960, and others suitable for this purpose. They are melted together with the waxes. The liquid wax dispersions described in the preceding paragraphs may be prepared according to the following procedure : Heat the waxes until a clear melt results. For this, a temperature of 212 to 230Â°F. is recommended. Then start the agitation and add the solvent in a steady stream, making sure that the temperature never drops below 185Â°F. Where limitations in plant equipment do not permit the melting of the waxes at the temperatures indicated, the melt with the solvent should be held at 185 to 190Â°F. with agitation for a certain length of time in order to assure complete solution of the highest melting wax components and any polyethylene in the formula. This step will also prevent premature crystallization of a part of the wax components which would later which would later result in separation and settling. After cooling the wax to room temperature with constant agitation, it may be passed through a homogenizer for further increasing its smoothness. The waxes and paraffin are melted together and then the slightly prewarmed solvent is added with good stirring. Solution should be complete, Otherwise, reheat slightly. Then cool with agitation to a temperature of 110 to 115Â°F. and pour into cans. Melt the waxes ; in a separate container the silicone oil is mixed with the mineral spirits and heated to approximately 120Â° F. This solution is added slowly with agitation to the wax melt. Solution must be complete, otherwise, reheat slightly. Then, while agitating, add the "Snow Floss" and the Tripoli. Cool the solution to 120Â° F. with continued agitation. Then pour in to cans and allow to cool undisturbed. This product can be readily made by conventional procedures. When the " water-to-wax" method of manufacture is used, it can be modified by reducing the amount of amine (morpholine and monethanolamine) recommended for a. It is also possible to employ other leveling resins than the recommended "Shanco" L-100. It is recommended that a be prepared by the "wax-to-water" method. This emulsion should be almost completely transparent. Best leveling is usually obtained after the final composition has been allowed to stand undisturbed for at least 24 hours. Mix a and pour into b. Impregate soft cotton cloth with above for 15 minutes ; squeeze and dry. Dissolve the "Ethofat" 60/15 and "Ethofat" 60/20 in the mineral oil using heat if necessary. The water is then added to the oil with agitation. Melt the "A-C" polyethylene 629, add the silicone and bring to 230Â°F. Heat naphtha to 158-176Â°F. and add slowly keeping temperature at 185 to 194Â°F. ( solution should be clear and homogenous). Continue agitation and cool to room temperature, charge to aerosol containers, cool, and pressure fill with "Genetron". To apply, spray light coat on clean surface and buff to high gloss. Melt the "A-C" Polyethylene and stearic acid together and add the silicone Cool to 221 to 230Â°F, and add the morpholine. Heat the naphtha to 158 to 176Â°F. and add slowly with stirring, holding the temperature at 185 to 194Â°F. (solution should be clear and homogeneous). Add the water (185 to 194Â°F.) with moderate agitation. Finally add the "Snow Floss" and cool with agitation to room temperature. To apply, rub in well to assure removal of surface film, allow to dry and wipe off. Stir polyethyleneglycol 1500, water, and "Tergitol" nonionic NPX until a clear solution is obtaind. If polish No. 1 is being formulated, add the citric acid and sodium chloride and stir until dissolved. Then, for both polishes, add the "MultiCell" 000 and the bentonite and stir until a smooth paste is obtained. Mix "Carbowax", water, and anionic, and stir until a clear solution is obtained. Add the citric acid and sodium chloride and stir until dissolved. Then add the "MultiCel" 000 and the bentonite and stir until a smooth paste is obtained. Immerse steel for 10 minutes, then wash with water. Dissolve the soap in part of the water, heating to obtain solution. Add the rest of the water and cool to room temperature. Add the ammonium carbonate, stir until dissolved, and then stir in nonionic NPX and "Carbowax" polyethyleneglycol 400. Add the abrasives and stir until throughly mixed and a smooth paste is obtained. The polish will become somewhat stiffer on standing several days. The amount of abrasives can be varied to obtain the desired viscosity. In the preparation of these polishes, the waxes and solvents are heated to approximately 200Â°F. or until a clear solution is obtained. The mixture is then cooled with agitation until the first sign of cloudiness after which the mixture is poured into a container and allowed to solidify. It has been found that homogenization of the muxture just after the first sign of cloudiness tends to give a much smoother paste. Melt the "A-C" Polyethylene and the waxes together and cool to 212Â°F. Heat the turpentine to 122 to 140Â°F. and add to the melt with stirring. Heat the naphtha to 122 to 140Â°F. and add with stirring. Continue agitation until the polish cools to 131Â°F. and pour into container. Apply in an even film and buff to a high gloss. Sodium Benzoate 10 ft. oz. In preparing opaque-white nonrubbing carnauba wax dispersions, use light-colored ingredients, a minimum amount of dispersing agents, and a mutual solvent. Wax dispersions are prepared by adding boiled water, containing the amine (if used) to the melted wax mixed with the other ingredients. Where soap flakes are used, they are dispersed in the melted wax before the water solution is added. Melt the waxes together and add the oleic acid and morpholine with stirring. Maintain the gel at 200 to 210Â°F. and add hot water at 205 to 210Â°F., slowly at first, with rapid stirring. After the gel inverts to an oil-in-water emulsion, you may add the water more rapidly. After half the water has been added, discontinue the heat and cool the batch as rapidly as possible while the remainder of the water is added at room temperature, with slow agitation. Use the procedure given under formula 1, but add the borax, dissolved in 25 lb. of boiling water slowly to the mixture of waxes and emulsifier. Melt and mix the waxes in a steam-jacketed kettle (or in a water bath, etc. ), add the "Triton" and stir in until dissolved ; then mix in the morpholine ; slowly add boiling water, a small portion at a time homogeneously absorbed, with constant agitation, until the first formed water-in-oil emulsion suddenly inverts to oil-in-water. Then add the balance of the water more rapidly, with agitation. Let cool. If making up a small amount, e.g., 5 gal. or less, hand stirring is sufficient for the agitation, but mechanical agitation is still to be preferred. The final one third or one quarter of the water can be added cold and mixed in. After the prepartion is made up to volume, it is not necessary to continue the agitation while cooling. Resin or shellac solutions (10 to 20%) can be stirred in hot or cold, as is the common practice with water-emulsion floor waxes. Melt the "Cardis", "Durez", carnauba wax, and oleic acid ; cool to 210Â° F. Then add the morpholine and stir 10 minutes at 210Â°F. Add the borax and caustic potash dissolved in 30 ml. boiling water and stir 10 minutes. Pour the hot wax blend into the total volume of water at 210Â°F. under strong agitation. cool, adjust the pH at 8.5 to 9.0 with ammonia, if necessary, and add the shellac substitute solution (12% "Durez" 15546) in water. The finished emulsion shows perfect water resistance, very good gloss, leveling, and wetting properties. The heat stability is very good. The freezing stability is fair and can be improved to perfection by using 3 g. of 2-amino 2-methyl propanol in addition to the indicated 5 g. morpholine. The water resistance of the last formulation is good for practical purposes. Melt the "Cardis" One, "Durez," " Warco," and oleic acid and cool to 210Â°F. Add the morpholine and stir 10 minutes at 210Â°F. Add the borax and caustic potash, dissoved in 30 ml. boiling water, and stir 10 minutes. Pour the hot wax blend into the total volume of water at 210Â°F. under strong agitation ; cool, adjust the pH at 8.5 to 9.0 with ammonia, if necessary, and add the shellac-substitute solution (12% " Durez" 15546 in water). Melt the "Cardis", "Durez" and oleic acid and cool to 210Â° F. Add the morpholine and stir 10 minutes at 210Â° F. Add the borax and caustic potash, dissoved in 30 ml. boiling water, and stir 10 minutes at 210Â° F. Pour the hot wax blend in to the total volume of water at 210Â°F. under strong agitation, cool, adjust the p H at 8.5 to 9.0 with ammonia water and add the " Durez" 15546 solution of 12% solid content, or as desired. Melt the "Cardis" One, "Durez", and "Warco" and cool to 210Â°F. Add the morpholine and stir 10 minutes at 210Â°F. Add the soap flakes and caustic potash dissolved in 40 ml. boiling water and stir 10 minutes. Pour the hot wax blend into the total volume of water at 210Â°F. under strong agitation, cool, adjust the pH at 8.5 to 9.0 with ammonia, if necessary, and add the shellac-substitute solution (12% "Durez" 15546 in water). Melt the "Cardis" One, "Durez," "Warco", and oleic acid and cool to 210Â°F. Add the morpholine and stir 10 minutes at 210Â° F. Add the borax and caustic potash, dissolved in 30 ml. boiling water, and stir 10 minutes. The finished emulsion shows very good water ressistance, gloss, and leveling properties. The films are highly scuff and wear resistant. Pour hot water into the melted wax. Pouring Temperature : 120 to 130Â°F. After preparation, the products are poured, while liquid, into glass bottles and placed in storage. Melt the waxes with 20% of the solvent ; then stir in the heated solvent; finally cool, with agitation, to room temperature. This remains fluid at low temperatures. The articles buffed with this compound are immersed in water, acidified with hydrochloric or sulfuric acid, to complete cleaning. Heat and mix until uniform. Melt waxes in steam bath or steam-jacketed kettle. Add solvents and heat until clear, if necessary. Cut off heat and cool to about 130 Â°F. Pour into containers and allow to solidity uncovered. Melt waxes at 100Â°C. and then cool to 85Â° C. Add turpentine and diglycol oleate. Stir till cold. Melt A at 90Â°C. until uniform and then add B.
Shellac Solution in 5 Â¼ oz. Water 5 3/8 oz. Booster Solution in 5 Â¼ oz. Water 2 Â¾ oz. The booster is made by adding 5 oz. Casein to 1 qt. water, mixing with a solution of Â½ oz. potassium hydroxide in 2 oz. hot water, then adding 1 oz. of strong ammonia, 0,8 oz. of zinc sulfate in 2 oz. of boiling water, and finally Â¼ oz. of yellow pine oil. The mixture is stirred until thick and 10 oz. cold water added. By omitting the final water (21 oz. ), a no-rub floor polish is obtained. The emulsion is maintained by the potassium hydroxide and oleic acid, which form soap. Boil about four ounces of comminuted castile soap in about one cup of water, pour the solution into 6.25 pounds of whiting, together with 1.5 ounces of aqueous ammonia, one ounce of olive oil and 0.5 ounce of oil of sassafras. The mass is mixed and kneaded until it has a relatively stiff moldable consistency. The kieselguhr and chalk serve as abrasives, the Lemenone as a perfume, the oil to impart a certain amount of sheen to the metal, and the glycerin as a lubricating dispersing medium. Stir a suspension of 100g. of calcium carbonate, 40 g. of kieselguhr, and 8 g. of rouge in 1 lt. of water and impregnate the cloths. Press out the excess liquid and dry the cloths at about 120Â°F. Then immerse the cloths in a hot 10 per cent solution of hard soap. Squeeze out excess fluid and dry again. The ingredients should be mixed in the order given. This makes a paste which gives a good shine. The solvent does not squeeze out when the mass is pressed and the mixture makes a firm jell. It should be poured at 90Â°C. Durocer (Synthetic Wax) 11 oz. Sovasol # 4 175 fl. oz. This produces a firm jell, on cooling, which polishes readily, is homogeneous and is not tacky. The waxes are melted together and mixed with the turpentine. The solution is then poured slowly into a boiling solution of the soap in water, meantime stirring vigorously to produce a stable emulsion. Stir until nearly ready to set and run into a container. Warm 1, 2, and 3 until melted. Keep temperature at 90 - 100Â°C. and add 4. Add 5 slowly with good mixing and continue mixing until temperature falls to 40Â°C. then pour into tubes. Mix well with a high-speed stirrer. Equal volumes of solutions A and B are placed in the bottles. This give two liquid layers of attractively contrasting colors. If too little linseed oil is used the two layers separate too quickly after shaking. If too much linseed oil is taken the polish dries dull. Shake well and apply with a clean cloth. Put turpentine, mineral spirits, and naphtha in container and mix with high speed mixer. Add linseed oil soap. Melt waxes and add slowly. Mix until cold. Apply hot and leave on for three minutes. Scrub lightly to loosen wax and wash away. To 500 parts of water, add 3 parts of sodium hydroxide and 12 parts of morpholine. Heat this solution to 85 - 90Â°C. Using continued stirring, add the "fine melt" Congo slowly, taking about 15-20 minutes to add the entire amount. It is very important that the resin be ground to powder size. Hold at 85 -90Â°C. for Â½ hour, during which time 100 parts of water are added. The resin should now be completely dissolved. In a separate container, melt together the carnauba wax and the stearic acid, and add slowly to the Congo mixture, always continuously stirring. Then add the triethanolamine and about 100 parts of hot water slowly, keeping the temperature around 80Â°C. The remaining 400 parts of water are added more quickly and the polish is allowed to cool to room temperature; water is added to compensate for evaporation loss, and the polish is then filtered. This polish exhibits excellent gloss, good leveling properties, and very good water resistance. Same method as in No. 2. The casein is soaked in 1900-2000 parts of water at room temperature for Â½ hour, with stirring. The mixture is then gradually heated. When the temperature reaches 52-55Â°C., the borax is added either as a solid or dissolved in about 150 cc. of water. Heating is continued and the solution completed by holding the batch at about 75Â°C.for Â½ hour, with stirring. Heat is removed, the phenol and pine oil are stirred into the solution, and the remainder of the water is added. When cooled sufficiently, additional water is added to make up for evaporation losses. The casein solution is incorporated in the polish just after the addition of the resin and after the temperature has been held at 85-90Â°C for Â½ hour. Same methods as in No.2. By increasing the amount of morpholine to dissolve the resin, the gloss of a polish is increased. This polish has very good gloss and leveling properties but shows a decrease in water resistance as compared to the other polishes prepared with morpholine. Triton W-30 is leveling and wetting agent. Any similar agents may be used in its place. The slight increase in carnauba wax helps greatly in improving the drying time of this polish. Abrasive granules (Moh hardness 7.5-8.5) are made by fusing a mixture of the following for 1 hour at 1205Â°, cooling, and crushing the melt. This paste rubbing compound is used for rubbing down fresh coats of lacquer or synthetic enamel. Apply with a damp cloth or waste. Rub until perfectly smooth and free from dirt specks, orange peel, etc. Put water and triethanolamine into pan of a dough mixer. Premix mineral oil, kerosene, pine oil, and oleic acid and add slowly, with good stirring. Then work in the Tripoli until a smooth and uniform paste is obtained. Apply "A" to all except the edge of the "coloring" wheel, using that dry edge as a wiper section. Should the work require an even higher luster, then add a touch of red rouge, "B," to the dry edge of the wheel. For spinning work the brass colored red with "A" and "B" cannot be surpassed in luster and freedom from scratches by the use of a "lime" composition. When an intermediate quality finish is required at a minimum cost and without a "cutting down" operation, a "cut and color" composition similar to "E" has proven very satisfactory. This compound is applied to hardwood novelties on a buffing wheel or in a tumbling barrel. It a applied directly over the stained wood, and produces a high-luster, very smooth finish. It gives the luster of a resin finish with the slip and feel of a wax finish. Oil Soluble Orange Dye 5/16 oz. Ammonium Hydroxide (28%) 3 lb. Put water, triethanolamine, and trihydroxyethylamine stearate in a steam-jacketed kettle and bring to 200.F. Melt waxes in another steam-jacketed kettle, stir in dye, silica and mineral spirits and bring to 200Â°F. Add this mixture to the water solution slowly, with vigorous stirring. Pre-mix resin solution and ammonia and add to the above solution. Cut off steam and stir occasionally until cold to prevent stratification. It will solidify to a smooth, soft paste. Yield 215 lbs. This compound is used with flexible-shaft mechanical buffers to produce a high polish on automobile finishes. It is non-scratching and leaves a protective wax film. The material is a heavy liquid cream emulsion, which is very stable. Put water in steam-jacketed kettle, add stearate, and heat to 165.F. Melt waxes and mineral spirits to 165.F. in water bath and stir in silica. Then add hot wax solution to water solution slowly with vigorous agitation. Mix occasionally until cold. Pieces of flannel or cheese-cloth are soaked in the mixture and allowed to dry. They are excellent for removal of dust and restoring the gloss of automotive finishes. In preparing impregnated cloths for cleansing and polishing brass, copper and silver, hard soap is found a good binding agent, as well as cleaner. Mix the ingredients and impregnate the cloths. Press out the excess liquid and dry the cloths at 120Â°F. The immerse in a hot 10% solution of hard soap. Squeeze out the excess fluid and dry again. Dissolve the soap in the hot water and add the previously mixed silica and Tripoli without stirring; then add pine oil, with stirring, and run the hot mixture into suitable containers. The abrasives, silica and Tripoli, should be able, almost 100%, to pass through a No.325 sieve. The mineral oil, pine oil and Blendene are thoroughly mixed. It is important that the liquid be clear. If not clear add Blendene in small quantities until it clears up. Then stir in the water in small portions until entirely ncorporated. Stir for 1 hour. High speed mixing is used. Melt the wax and to it add slowly with stirring the turpentine. Cool slowly while mixing. Melt the carnauba wax and add the other ingredients. Warm together in a double boiler until dissolved. Stir until cool and smooth. Grind to a very fine powder. Add the melted paraffin wax to the silicone heated to about 150.F. and cool. Any of these oil polishes can be used on furniture, woodwork, and automobiles. As emulsion, they clean and polish the surface in one operation. The polish can be rubbed dry to give a glossy finish on a varnished or lacquered surface. The addition of 0.07 to 1.0 parts by weight of 10% aqueous solution of cellosize hydroxyethyl cellulose WS-500 to the above emulsions assures stability over a longer period of time. Dissolve the oleic acid in the oils and stir in the amine. Stir for about 5 minutes. If the mixture is not then clear, add oleic acid a little at a time until clarity is attained. Add the oil solution of the water with vigorous stirring to form a creamy, stable emulsion. The clear oil solution can be marketed with directions to mix it with an equal amount of water before use, pointing out that it can be stored as an oil to be mixed with water when desired. When these polishes are to be used on automobile or other lacquered surfaces, a small amount of a fine abrasive is frequently added as an ingredient that cleans by friction. Wax polish emulsions require more rubbing than oil polish emulsions, but produce a harder, high luster finish. These polishes are cleansers and polishers combined and leave a bright, hard film. They are applied by rubbing well over the surface to remove dirt and streaks, and then polishing with a dry cloth. The wax mixture usually contains a hard wax, such as carnauba, and a soft wax, such as paraffin or beeswax, which acts as a plasticizer. The use of naphtha in a wax polish allows faster application without leaving a tacky film. The morpholine emulsion films become water-resistant several hours after application and will stand up under constant exposure to water fully as long as a solvent-type wax polish. The liquid cream wax polish is more easily applied than the wax paste polish and does not require as hard buffing to produce a high gloss. The liquid wax polish makes an excellent shoe cream polish and can be used with the addition of nigrosine for black shoes or, with the addition of other suitable dyes, for colored shoes. A steam - or hot water-jacketed kettle is preferred for making wax polishes, as a satisfactory temperature must be maintained to prevent caking of the wax along the sides of the kettle and to avoid discoloration by overheating the wax. A paddle-type, hand-operated stirrer or a slow speed, large-bladed propeller is also suggested for successful operation. Since morpholine has a flash point of 100Â°F., it should not be added to the mixture in the presence of open flame. If the wax is melted by means of a gas burner, the gas should be turned off during the addition of the morpholine. Melt the waxes and stearic acid, add the amine, and maintain the temperature at about 90Â°C. Add the naphtha slowly and stir until a clear solution is obtained and the temperature is 90Â° to 95Â°C. Avoid the use of open flames. The method of adding the abrasive depends upon the type used. An oil-absorbing abrasive, such as Tripoli, should be well mixed with the hot naphtha solution of waxes just before the water is added. An abrasive that absorbs water, such as bentonite, is best stirred into the finished emulsion. Heat the water to boiling, add it to the naphtha solution, and stir vigorously until a good emulsion is obtained. Continue stirring slowly until the emulsion has cooled to room temperature. The proportions of waxes can be changed as desired, depending upon the case of polishing required and the hardness of the final film. A high melting hydrocarbon wax can be used in place of all or part of the beeswax with good results. When the primary use of the automobile polish is for polishing rather than as a cleaning and polishing combination, it will be more satisfactory without an abrasive. This polish produces a glossy film that can be readily re-emulsified or removed with water. A rubless floor polish prepared in this manner should give a clear, bright film when applied to linoleum, mastic, hardwood, and other floor surfaces. The addition of dispersed shellac or casein improves its spreading and flow-out properties. A steam - or hot water-jacketed kettle is preferred for maintaining a uniform temperature and prevent overheating and caking of the wax along the sides of the kettle. A paddle-type, hand-operated stirrer or slow-speed, large-bladed propeller is recommended for successful operation. Melt the wax and the oleic acid, stirring occasionally to break up the wax lumps. Bring the temperature to 95Â°C. Add the triethanolamine slowly, stirring constantly until the mixture becomes clear. Dissolve the borax in 20 lb. of boiling water; pour this solution into the wax mixture, stirring until a clear, viscous mixture is obtained. Add the remaining boiling water to the mixture slowly, with steady stirring, a small portion at a time. Each portion of water should be thoroughly incorporated and the stirring continued until and mixture returns to a smooth, even consistency before the next addition is made. The mixture will become more viscous when the water is first added and then becomes thin again. When about one-half to two-thirds of the water has been added and the mixture becomes water-thin, the rest of the boiling water can be added slowly, but continuously, with steady stirring. If the mixture becomes creamy at any time, the water is being added too rapidly and is not being thoroughly incorporated before the next addition. The final polish should be light colored and translucent, less opaque than milk. The best results are obtained by using all of the water at boiling temperature. However, if more convenient, only about two-thirds of the water in the above formula need be heated to boiling. The rest of the water may be at room temperature when added, with constant stirring, to the hot polish. This final dilution with cold water may be made at any time. The polish is allowed to cool with occasional stirring, covering between stirrings to prevent crusting or graining on top. If cold water can be run through the jacketed kettle, the cooling can be accomplished more quickly. Make a dispersion of bleached, dewaxed shellac or casein and add 2 gal. of the resin dispersion for each 10 gal. of polish. Follow the instructions for Method 1 through the first three steps or until the borax solution has been incorporated. Add about 6 lb. of boiling water and stir for several minutes after the mixture becomes clear. Add the remaining water, at boiling temperature, quickly, all at one time; and stir until a smooth dispersion is obtained. Cool as directed under Method 1. Shellac or casein dispersion can be added, if desired, using 2 gallons of the dispersion for each 10 gallons of polish. VARIATION : a cake polish can be made with about one-third the water used above.. When ready for dilution, the cake is melted in a steam-jacketed kettle and the rest of the water added, half at boiling temperature and the rest at room temperature. A triethanolamine polish made with a small amount of potassium hydroxide has been found to produce a film more water-resistant than the film of a polish made with borax, but not so resistant as a morpholine polish film. A steam- or hot water-jacketed kettle and a paddle-type, hand-operated stirrer or slow speed large-bladed propeller are preferred for successful operation. The wax should not be allowed to cake around the sides of the kettle at any time. Melt the carnauba wax and the oleic acid, stirring occasionally to break up the wax lumps, and bring the temperature to 95Â°C. Dissolve the potassium hydroxide in about an equal weight of water, add this hot solution and the triethanolamine to the melted wax mixture, and stir until the mixture becomes clear. Heat the remaining water to boiling and pour it quickly into the wax mixture all at one time. Stir continuously until the wax mixture is entirely dispersed in the water. This water-resistant, rubless polish is a translucent solution if prepared as directed. When spread evenly over a surface and allowed to evaporate, it dries to a hard film of high brilliance. The water resistance of the film increases for several hours after application and finally the coating is unaffected by water. For successful operation in making a rubless polish, a steam-jacketed kettle and a hand-operated paddle or slow speed, large-bladed propeller are recommended.The wax should not be allowed to cake around the sides of the kettle at any time. Melt the wax in the oleic acid, stirring occasionally to break up the lumps. Bring the temperature to 95Â°C. and stir until well mixed. Add the morpholine and continue stirring until the whole mixture becomes clear. Since the flash point of morpholine is 100Â°F., this addition should not be made in the presence of open flames. If the wax is malted by means of a gas burner, the gas should be turned off during the addition of the morpholine. About 20 lbs. of water, which has been heated to the boiling point, is added and stirring is continued until a clear, viscous mixture is obtained. Add the remainder of the boiling water, a small amount at a time, with steady stirring. Each portion should be well incorporated before another addition is made. The mixture becomes increasingly viscous and should be of the appearance of petrolatum when about one-half of the water has been added. After this stage has been reached, the mixture begins to thin out. After about two-thirds of the water has been added, and the mixture has become definitely thinned, the remaining water can be added slowly, but continuously, with constant stirring. The polish should be covered and stirred at intervals until cool, to prevent caking on the top. A resin dispersion improves the spreading and flow-out of the polish. The technique of making a morpholine rubless polish can be simplified by the use of Tergitol wetting agent 4, and less time and effort are required to produce a more uniform product. The dried film of a polish made by this method is more even than a film of polish made by the previous method, with no impairment of its water-resistant properties. The purpose of the Tergitol wetting agent in the rubless polishes is to disperse the hot wax mixture more quickly into the hot water and to produce an emulsion with a desirable size of wax particle, which should dry to a smooth wax film of good luster. This wetting agent also produces a desirable viscosity in the emulsion at all times and permits the manufacture of a superior product. Less tergitol wetting agent 4 is usually required in a polish made with carnauba wax No.2 or 3 or carnauba wax substitutes, such as the higher melting hydrocarbon waxes, than in one made with carnauba wax No.1. The addition of too much wetting agent produces an almost clear polish, which dries with a bright, though less even, film. The completed formula plus the resin dispersion contains about 15% total solids. About 30 lb. more water can be added to the above formula at any time to produce a polish with about 13% total solids content. A hot water - or steam-jacketed kettle and a hand-operated paddle or slow-speed, large-bladed, motor driven propeller are recommended for successful operation in making rubless polishes. Melt the carnauba wax in the oleic acid, stirring occasionally to break up the wax lumps. Bring the temperature of the melted wax and oleic acid to 95Â° to 97Â°C. Stir in the morpholine and continue stirring until the mixture becomes clear. Since the flash point of morpholine is 100Â°C. this addition should not be made in the presence of open flames. If the wax is melted by means of a gas burner, the gas should be turned off during the addition of the morpholine. Stir in the Tergitol wetting agent 4 and continue stirring for about 3 minutes after the mixture becomes clear. The temperature should be maintained at 95Â° to 97Â°C. Heat the water to boiling temperature while the wax is melting. Add all of the water (98Â° to 100Â°C) to the melted wax mixture and stir until a uniform dispersion is obtained. The water should all be added in about 10 to 20 seconds. The emulsion should be stirred for 5 to 10 minutes after adding the water; it can then be covered and stirred at intervals until it has reached room temperature or it can be cooled quickly by pumping through a cooling system or by running cold water through the water jacket on the mixing kettle. A resin dispersion, such as Manila loba resin B can be added to increase the spreading and flow out properties. The melted wax mixture containing the wax, morpholine, oleic acid and Tergitol wetting agent 4 at 95Â° to 97Â°C is poured, all at one time, into the water at 98Â° to 100Â°C. with stirring: and the stirring is continued until a smooth emulsion is obtained. The polish can than be cooled as above and the Manila loba resin dispersion added. Thus a smaller wax kettle can be used, the water being heated in the larger kettle. The addition of a resin dispersion increases the spreading and flow-out properties of the rubless floor polishes and improves the smoothness of the dried polish film. Shellac is preferred with the triethanolamine rubless polish, while Manila loba B resin dispersion produces better results in the morpholine rubless polish. A casein dispersion can be used with any of the rubless polishes and probably improves the smoothness of the polish film more than either a shellac or Manila loba resin dispersion. However, the water-resistant properties of the films are noticeably reduced by the casein dispersion, while neither the shellac nor Manila loba resin dispersion affects this property. Excellent leather polishes may be produced with any of the rubless polishes by incorporating the casein dispersion. Mix the powdered Manila loba B resin with the ammonia. Stir in about 10 lb. of water, heated to about 60Â°C. This produces a gummy mass, which is allowed to stand for several hours or overnight. Add about 10 lb. more water, heated to 70Â°C, and stir until a uniform mixture is obtained. Heat the mixture to about 60Â°C, with constant stirring, to assist in getting a smooth dispersion. If the dispersion is not clear at any time, stir in more ammonia, a little at a time, until clarity is obtained. If a small amount of resin remains suspended, it should be removed by filtering the dispersion through a cloth. The clear, filtered dispersion is allowed to cool and can than be added to the cold polish at any time. About 1 gal. of resin dispersion to 5 gal. of polish produces the desired results. The proportions given make sufficient resin dispersion for the amount of polish produced by any of the rubless polish formulas. Dissolve the ammonia, morpholine, and triethanolamine in one-half of the water and stir in the powdered Manila loba B resin. Warm to about 55Â°C. and hold at this temperature for about 15 minutes, with constant stirring. The remainder of the water is then stirred in. the small amount of undispersed material can be allowed to settle and the clear liquid drawn off or the whole dispersion can be strained through several thickness of cheesecloth. Add the ammonia and about one-half of the water to the fresh shellac and warm, with constant stirring, until solution is complete. The shellac may become difficult to disperse if it is kept too long, while Manila loba B resin improves with age in this respect. Add the rest of the water. The solution should be clear. More ammonia should be added if it is not clear. Filter, if necessary, cool, and add to the cold polish. About 2 gal. of the shellac dispersion can be added for each 10 gal. of polish. Soak the casein in one half of the water for several hours or over night. Add the ammonia to the rest of the water, and stir this solution into the soaked casein. Warm, with constant stirring, to about 60Â°C. and continue stirring at this temperature until a smooth mixture is obtained. Add 0.16 lb. (2.5 oz.) of phenol, which acts as a preservative. The dispersion will be slightly viscous but will become thinner as it stands. It should be aged for at least a week before it is added to the polish unless a slightly viscous polish is desired. If the polish is to viscous when the aged casein dispersion is added, 30 lb. of water can be used to thin it, and the completed polish will contain about 13% total solids. This is well within the range of most of the commercial rubless polishes, especially where the actual carnauba wax content is as high as in the suggested formulas. The casein dispersion is easily made and keeps indefinitely when a preservative is present. Only sufficient ammonia to disperse the casein should be used, as higher amounts will increase the viscosity of the dispersion. Subcarbonate of Iron 3 oz. The silica is ground to a very fine powder and mixed with the iron. After melting the petrolatum, the cottonseed oil is added, and the powder stirred in. The benzaldehyde is added while cooling, and the compound is run into flat cans or other containers. The paste is applied with a soft rag. until uniform. Pour into molds and allow to cool. Dilute with water for use. After thorough mixing, this composition can be used in polishing silver, nickel, and other non-ferrous metals. It is used by rubbing on the metal with a damp sponge or rag which is followed by rubbing with a dry chamois or cloth. The bentonite is worked into a paste with a minimum amount of the water, the lumps being macerated until a smooth dispersion results. The anhydrous soap is dissolved in the remainder of the water, which is then mixed with the bentonite dispersion. The powdered silica is then added, and finally sufficient red oxide of iron to bring to the desired color. The carnauba wax is melted and poured into the heated naphtha (85-95Â°C.) with vigorous agitation. The emulsifying agent is dissolved in the water. The wax solution is then poured, while both solutions are still quite hot, into the water solution with vigorous mechanical agitation. The mixture is continuously stirred until cooled to room temperature. While still hot, the powdered silica and the rouge are added. NOTE : The above described smoothing compound and polishing compound are designed for manual use, the purpose of which is to remove and repolish scratched and scored surfaces of Lucite and Plexiglas bringing them back to their original transparency, gloss and surface sheen. The compositions are applied with a soft cotton rag and rubbed locally in one direction only until and scratch marks or the rough surface have attained a reasonable degree of polish with the smoothing compound, when the operation is repeated for the polishing compound. Obviously, if there are rough surfaces such as from sawing or filing or deep scratch marks these surfaces will have to be initially finished with a file, followed by #2/0 sandpaper or finer before using the smoothing solution followed by the polishing compound. Heat and mix until emulsified. Ouricuri, Gray Carnauba or Shellac Wax Â¾ lb. Ceresin, Paraffin Wax Â½ lb. Castile or Good Curd Soap 2 oz. Water-soluble Nigrosine Black Dye 4-6 oz. Melt the waxes in one container. Separately boil the water with the soap, alkali and nigrosine. Stir the black water solution into the melted waxes. Cool down quickly. By the addition of further quantities of water, creams of various consistencies may be prepared, e.g., Â½ gal. of water will give a nice firm cream. Instead of black, the polish can be colored yellow or red with 1-2 oz. of the appropriate dye for floor or furniture polish. A. Soft Water 4 gal. Water-soluble Nigrosine Water Dye 3 lb. Potassium Carbonate (or 8 oz. Caustic Soda) 18 oz. Rosin (Can Be Omitted) 8 oz. Boil the water; add the nigrosine in small quantities until quite dissolved, and then the other components. Keep just on the boiling point until mixture B is ready. Paraffin Wax 8 Â¾ lb. Ceresin or Ozokerite 7 Â½ lb. White Spirit or Pool Distillate 3Â½ gal. Turpentine or White Spirit 3 pt. Melt the waxes and oil black together. Remove the flame and stir in the solvents. Add to the hot black water mixture A with stirring. Cool slightly and pour into tins or glass jars. Alternatively, some manufacturers may prefer to melt the waxes and follow with the solvents and then the black solution. A brown and toney-red boot polish can be prepared in a similar way by substituting the appropriate dyestuff for the nigrosine. The inclusion of Â½ lb. Triethanolamine oleate to the boiling water will improve the smoothness of the polish. Warm together until clear; mix and pour into containers. A. Carnauba Wax 25 g.
C. Distilled Water 15 cc. Caustic Soda (50%) Â½ cc. Melt A, add B (hot), and then C (hot). Stir continuously while cooling to a cream consistency. Pour while fluid, but not too soon. Dissolve the water-soluble dye in half the water. Add the caustic soda solution and, while hot, add the soap and stearic acid. Bring to boiling. Then add the remaining ingredients at about 85 to 90.C. continue stirring until cold. Replacing the nigrosine with other suitable dyes will yield products of other requisite shades of color. Mix A and stir until the ingredients are dissolved, then add B. stir until a smooth emulsion is formed. After the initial gloss of rubbers is dulled the luster can be restored by cleaning with a slightly damp rag and then applying the following solution with a clean rag.sponge or soft brush. Unlike oils and ordinary shoe polishes it will not rot or swell rubber. (a) Carnauba Wax 60 g.
(c) Dewaxed Shellac 15 g.
Melt (a) together over direct heat, oil bath, or water bath, in a glass, stainless steel, or enamel vessel. Heat to about 95Â°C. Dissolve the borax in the water, heat to 80 to 85Â°C, stir in ammonium hydroxide and add (b) to (a), with thorough mixing to give a dark, nearly transparent, viscous, water-in-oil emulsion. Heat (c) together, with stirring, until the shellac dissolves completely, and the temperature is 95 to 100Â°C. Have this ready, and begin to add it a little at a time to the mixture of (a) and (b). Mix rapidly and thoroughly as each portion of shellac solution is added, adding 15 to 20 cc. at a time. When about 50 to 100 cc. of shellac solution has been added, sharp decrease in viscosity will be noted. Then add the balance of the shellac solution rapidly, with very thorough mixing. This results in phase inversion to wax-in-water emulsion and should yield a semitransparent product. Continue to stir until cool. Cooling may be hastened by a cold-water bath. This wax emulsion now contains 20% solids, and may be diluted with 340 g. cold water to give 850 g. wax dispersion containing 12% solids, the usual concentration for use. Melt (a) and (b) together at 205Â°F. Add (c) and (d) and stir thoroughly. Without agitation other than that of pouring add(e). Lumps will form from localized cooling, but these will re-dissolve. With a high-speed agitator running in large tank of (f), pour in the above base mix. This will produce an excellent emulsion. Then add the shellac solution and cool as quickly as possible. Lumps will form from localized cooling on addition of the borax-ammonia solution. Stir very little to avoid excessive volatilization of the ammonia. Melt (a) together at 205Â°F., then add (b) and stir well. Without agitation other than that of pouring, add (c). Lumps will form from localized cooling, but these will re-dissolve. Pour in the whole mixture into a tank with a high-speed agitator running in the boiling water. Then add the shellac solution and cool as quickly as possible. Add 20lb of a standard shellac solution to 100 lb emulsion. Cardis Wax No. 319 42.0 g.
Shellac Aqueous Alkaline Solution (12%) 200.0 g.
Water To make 1,000.0 cc. Melt the waxes and then add the soap flakes and stir well until dispersed. Keep the temperaature close to boiling. Then add the borax dissolved in equal volumes of water. Then add the triethanolamine. Stir well until incorporated. Add the water a little at a time with stirring. Each addition of water should be stirred until the mass has a salve-like consistency. When about a third of the water has been added, the consistency thins out and at this stage, the water can be added rather rapidly. When cool, add the shellac. The finished emulsion should have a pH of 8.5 to 9. This product gives a very superior high-gloss polish without rubbing. In formulae 12 and 13, the wax is melted with a fatty acid, usually red oil (oleic acid), in asteam-jacketed kettle which is equipped with a stirrer. The mixture is held at about 194Â°F. and stirred until homogeneous. The amine is then added slowly and agitation is continued until the mass is uniform. The water is brought nearly to the boiling point in a separate kettle and added in small portions with continuous stirring. Each portion must be fully incorporated before the next portion is added. The mass gradually thicknes, and then thins upon the addition of more water. After the thinning point is reached, the remainder of the water may be added rapidly. Agitation is essential until the finely dispersed globules of wax solidify. 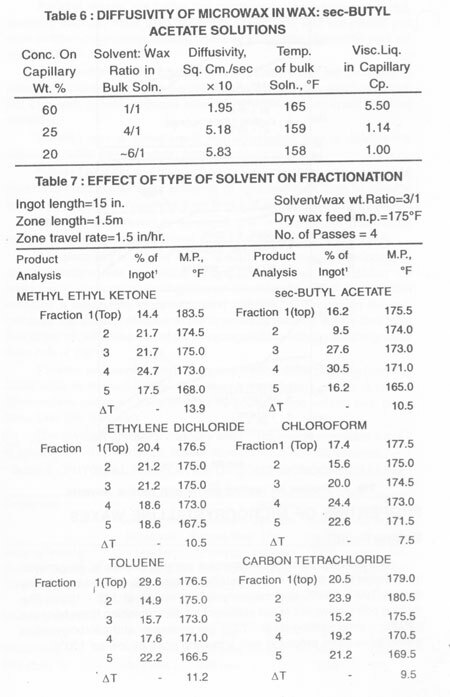 In order to improve the antiskid and leveling properties of these formulas, a shellac solution may be added to the thinned emulsion. This solution is prepared in a jacketed kettle by dissolving 5 parts shellac in 25 parts water and 0.8 part 28Â° Be' ammonia (33% by weight) at a temperature of not over 120Â°F. The solution should be filtered before use. Borax may be substitued for 25% of the amine in the soap without influencing gloss or tackiness. Streakiness is decreased by the use of borax. An excess of amine over the amount required causes streakiness and loss of stability. An excess of oleic acid decreases streakiness, but also decreases gloss and stability and causes tackiness. Other natural and synthetic waxes and resins may be substituted for carnauba wax. Melt the waxes together and add the soap with stirring. When the soap is dissolved in the wax, let the temperature drop to 205Â°F. Add the hot solution of borax in 45 parts water. Stir until a gel is formed. Add 1,300 parts of the boiling water slowly with good stirring. Add a solution of the shellac to the ammonia and the rest of the water. Heat the wax and triethanolamine oleate together, with agitation, at 200 to 205Â°F., until molten. Add a hot solution of borax in 3 parts ammonia and 16 parts water. Add 825 parts boiling water with good stirring. Add a solution of the shellac in 3.4 parts ammonia and 172 parts water. Mix the wax and Indusoil and heat with stirring to 195Â°F., maintaining this temperature until all the wax is melted. Slowly add the triethanolamine, stirring constantly until the solution becomes clear. Dissolve the borax in about 20 parts boiling water and add it to the wax solution. Stir for 2 minutes. Heat about 700 parts of the water to boiling and add about 40 parts slowly with constant agitation. Then stir the remaining 640 parts rapidly and thoroughly. Mix and heat the ammonia, shellac, and the rest of the water until solution is complete. After cooling, add this solution to the cooled wax dispersion. Naphtha (Sovasol No.5) 78.4 lb. Paraffin Wax (135Â°F) 10 lb. Heat the waxes until melted. Add the naphtha and stir. Warm until the solution is clear. Pour at 160Â°F. into a container. Cool. Teglac Resin No. 128 97 lb. Low-Viscosity Ethyl Cellulose 5 lb. Heat the alcohol slighly, add the Teglac Resin No. 128 which has been powdered, then slowly add the ethyl cellulose until completely dissolved and clear. Allow to cool. Melt (a) together. Add (b) and adjust to 160Â°F. Add (c) and stir. Prepare (d) separately and heat to 155Â°F. Add (d) to the mixture with vigorous stirring. Melt (a) on a water-bath. Heat (b) and add slowly to (a) with stirring. Add (c) to this mixture slowly when the temperature is about 90Â°C. Add the Veegum to the water slowly, continuously agitating until smooth. Heat this liquid gel, add it to the naphtha wax solution and agitate rapidly until cool. Some waxes are practically insoluble in certain solvents when they are cold. When the mixture of solvent and wax is heated, the wax dissolves to form a clear solution. If the mixture is allowed to cool, the wax crystallizes out of solution. The size of the crystals can be controlled by the rate of cooling. If the proper ratio of wax to solvent is heated and then cooled at a controlled rate a firm paste results. A hard paste may be made from carnauba wax and a solvent, but there are properties of toughness, ease of spreading, leveling, ease of polishing, etc., which can be improved by the addition of other waxes and resins. A very common formula for paste wax uses carnauba wax, beeswax, and paraffin in the proportion of 1:1:1. The solvent should be warmed to 150Â°F. to prevent precipitation of the wax. An alternate method is to make a 50% solids solution of the resin in mineral spirits and add prior to thinning. This eliminates the high temperature of 325Â°F., a top temperature of 250Â°F. being sufficient. Dissolve the resin in an equal part of mineral spirits, using agitation with or without heat. Warming the solvent and adding the resin in small pieces, with agitation, works well. Melt the waxes at 275 to 300Â°F. When completely dispersed, add the Durez 51270 Resin solution. Warm the solvent to prevent solidification of the wax and add to the wax-resin blend. Stir well, cool to 160Â°F., and pour into containers. Melt the waxes together, then add the turpentine and enough nigrosine to give the desired color. In formulae 3 and 4, heat (a) on a water-bath to 95Â°C. Add the turpentine slowly with sirring. Add the Veegum to the water slowly, continuously agitating until smooth. Add the nigrosine to this liquid gel. Heat to 70Â°C. and add to the mixture, stirring constantly. Add the Veegum to the water slowly, continuously agitating until smooth. Dissolve the castile soap in this liquid gel with heating. Heat (a) to 95Â°C. Add the turpentine slowly, with stirring. Add this mixture to the Veegum solution and mix rapidly until cool. Aqualized Gum Tragacanth 2 oz. Bismarck Brown Solution 6 oz. The pigment is added to the solution of water containing the soap and gum arabic. After mixing, the latex is added and stirred well. This dressing will not rub off due to the special binding effect of the rubber latex. Add the Veegun to the water slowly, continuously agitating until smooth. Add the titanium dioxide to this liquid gel and mix until uniform. Add the other ingredients to the Veegum mixture and mix thoroughly. Heat (a) and stir until uniform. (Heat No.3. on a water-bath.) Heat the triethanolamine and add it to (a) slowly. Then add the naphtha slowly with stirring. Add the Veegum to the water slowly, continuously agitating until smooth. Add this liquid gel to the mixture and then add the abrasive slowly with mixing. Mix together the mineral oil, naphtha and stearic acid and heat to 122Â°F. Mix the water and amine until a clear solution is formed. Add the oil-naphtha-stearic acid solution to the water and amine. Stir during the addition and continue stirring until cool. This polish should be shaken before use. Neutral Paraffin Oil 27.00 gal. Pale Blown Castor Oil 3.00 gal. Color (Green MX Concentrated Crystals) 0.04 gr. Place the water in a mixing tank. Mix the gum tragacanth with the isopropyl alcohol, then add to the water in the tank and start the mixer. Then add the glycerin and formaldehyde. Mix for several minutes. In a separate tank, mix the paraffin oil, petroleum spirits and the pale blown castor oil and pour the mixture into the mixing tank. Then add the snow floss. In a bucket, dissolve the color in water and pour into the mixing tank. Dark Red Oil 9 gal. Air-Float Cream Tripoli 250 lb. Aqua Ammonia (26Â° Be') 3 gal. Mix the kerosene, dark red oil, paraffin oil and xylol while adding the bentonite. Then add the air-float cream tripoli, mixing thoroughly. Then pour in the water very slowly with constant mixing. When the mixture is a smooth pasty mass, the water may be added faster. Add the aqua ammonia. Mix for 5 minutes, then add the isopropyl alcohol. Mix for 2 minutes. Take a sample and let it stand overnight. It should show only slight separation at the top which should go into solution. There should be no pigment separation at the bottom. Light Mineral Oil 7.25 gal. Steam-Distilled Pine Oil 2.75 gal. Dark Red Oil 23.00 lb. Seneca D.G. Rose Tripoli 300.00 lb. Sodium Hydroxide (50%) 7.00 lb. Put the tripoli in a bread-mixing machine. Then the kerosene, light mineral oil, pine oil and red oil into a separate pail. Start the mixer and add the oil mix to the tripoli in the bread mixing machine very slowly. It should take at least 1 hour for the sodium hydroxide solution to drop out. If the compound is not heavy enough, a little red oil or caustic soda will easily adjust it. Red oil should be tried first. This has the same polishing efficiency as pure coarse diamond powder. Melt the wax and add the graphite and lampblack, cool the mixture to 100Â°F. and cast in molds. Use hot stove, apply the stick to the stove and polish with cloth. Melt the mix and cast into bars. Mix (a) together. Add the velum to the water slowly, continuously agitating until smooth Add this liquid gel to (a). Heat until uniform. Mix mechanically until cool. Ammonida (26Â° Be') 3 lb. Ivory Soap Flakes 30 lb. F.D. & C. Red No.5 4/100 lb. Heat 25 gal. of the water to almost the boiling point Then add the soap flakes and the methyl parasept and mix until dissolved. In the meantime, in a good sized bucket put in the remaining 2Â½ gal. water and dissolve the oxalic acid, heating if necessary. Add the ammonia and light soda ash, slowly since a high effervescence will occur due to the liberation of carbon dioxide. Test for pH; if 7or higher, add this to the soap solution. Now add the Snow Floss slowly, mixing until all the lumps are smoothened. The addition of glycerin will help. Finally, add the perfume and color dissolved in 1 pt water. Dissolve the acid in the water. Heat not over 180Â°F. Then add the ammonia, stirring until well mixed. (b) Indusoil (Tall Oil) 13.0 lb. Ammonia (26Â° Be') 10.0 lb. Dissolve the caustic soda in the water and add the Indusoil. Stir well and add this to the alcohol. Finally, add the ammonia. Pour (a) into (b) with continuous stirring and add simultaneously 100 to 200 lb. of a suitable abrasive. The Indusoil, diglycol laurate, petroleum and alcohol are stirred and the ammonia added. To the emulsion formed, the kieselguhr and then water are added with stirring. The ammonia is added to the mixture of oils and alcohol with stirring and then the whiting is slowly admixed. The addition of a wetting agent, e.g. Sulfatate B or Nacconol NRSF ( 3 to 5%) to liquid metal polishes gives more intimate contact between the abrasive and metal and reduces hand labor. Wetting Agent (Goremul A) 10 cc. Water To make 4,000 cc. The wax and tallow are melted and the Silex is admixed. The heat is cut off and the kerosene added and mixed until uniform. The color, perfume, and ammonia are then added as cooling takes place. Heat the water to about 80Â°C. and add the sodium oleate with constant stirring, then the pine oil and silica. Let cool to room temperature (20Â°C) and add the ammonia with more stirring. This will form a cream emulsion which should not settle out. Sodium Fish Oil Soap 6-8 oz. Use at 160 to 200Â°F., preferably agitating the work. Immerse first in Stoddard solvent to shorten time of treatment. Add 3 to 5% Nacconol NR to the buffing composition to facilitate its removal in subsequent cleaning operations. Pine Oil 6 fl. oz. Oleic Acid 6 fl. oz. Pulverized Silica (300 Mesh) 1Â½ lb. Water To make 1 gal. Stir the polyethylene glycol, water, and "Tergitol" until a clear solution is obtained. For formula 1, add the citric acid and sodium chloride and stir until dissolved. Then, for all three formulae, add the "Multi Cell" and the bentonite and stir until a smooth paste is obtained. The polyethylene glycol inhibits the solution so that it attacks only the peaks of the microscopically jagged surface, leaving the low points untouched. This leveling action results in smoothness and brightness. The three liquids in this solution are miscible at any temperature. The solution itself requires only a low voltage, is non hazardous and nearly odorless, and does not form any sludge. In addition, it has good throwing power and good deburring action. It produces a highly passive surface and gives a bright luster to both nickel-chrome and plain-chrome steels. Clean the nickel and treat with this solution. Heat the water, glue, and stearate and mix until uniform. Mix in the grit and stir until cool. Apply this to the metal instead of to the buffing wheel. Heat a and mix until uniform; cool to room temperature and mix in b. This gives better and faster polishing, long wheel life, and lower costs than solid buffers. Keep away from flame or sparks. Diamond powder, compounded in an oily medium in the form of a paste for lapping and polishing, is becoming increasingly important in many industrial applications. It is an economical diamond-powder application, specially where good adhesion to the grain is required, such as when fast rotating laps are employed. In addition, as a paste, the abrasive is easier to handle and store than loose diamond powder or powder that has been mixed with a light oily substance, such as olive oil. The value of such a paste is apparent for two main reasons. First, the work can be cleaned readily and thoroughly by application of water for occasional inspection during and on completion of the lapping, polishing, or cutting operations. Second, the salvage of the used diamond powder is greatly simplified since, on addiing water to the paste, the diamond powder together with the abraded metallic particles will settle. Solubility or dispersibility in water. No tendency to dry out, "roll up," or to become so viscous as to be unworkable after a prolonged period of working. Good adhesion to the work-piece. The abrasive should be held in suspension and show no signs of settling. The paste should be colorless or white, so that it can be colored to correspond with designated various micron sizes of the diamond. Diglycol sterate S, polyethylene glycol 400 monostearate, and "PEG" 42 have been found satisfactory as such carriers when dispersed in ethylene or propylene glycols to give a consistency similar to that of low-melting petrolatum; 25 to 28% diglycol stearate S and 50 to 55% "PEG" 42, or polyethylene glycol 400 monostearate in ethylene glycol give a suitable consistency. The dispersion is made by dissolving the ester in hot glycol at a temperature above the melting point of the ester, with thorough stirring while the dispersion is cool, until a smooth, creamy paste results. Water is unsatisfactory as a dispersing medium. The powdered diamond itself can be readily and uniformly dispersed in these pastes by efficient mechanical mixing. An alternative procedure would be the melting of the paste followed by the addition of the correct amount of the diamond-paste abrasive. The entire mixture may then be cooled to room temperature, with thorough stirring. Since the pastes are white, they can be dyed easily so that the micron size of the diamond-powder abrasive suspended in the paste may be designated by a specific color. The dye may be introduced into the paste by melting it and adding a small amount of the dye with subsequent thorough stirring and cooling to obtain an evenly colored product. It has been found that oil-soluble dyes dissolve readily in these pastes and if the paste is dissolved in water, the dye also dissolves in it. Emulsify a by mixing and passing through a colloid mill. Then add a suspension of b and mix well. Mix and heat the silicone, kerosene, and "Armac" thoroughly to dissolve the "Armac." Add the water slowly, with constant agitation, and run the emulsion thus formed through a homogenizer to obtain finer particle size and to improve stability. This formulation yields an economical auto polish which cleans the surface as it is applied and dries to a glossy silicone film. Heat first four items to 140Â°F. and mix. Slurry last four items and heat to 140Â°F. Add former solution to slurry slowly with high-speed agitation. The clay and silica are first added to the water containing the Morpholine and thoroughly agitated until a thin slurry is obtained and heated to 60Â°C. The silicone oil, "Canawax," oleic acid, and 10 to 20% of the solvent are heated to 90Â°C. and mixed until all the wax has been dissolved. The remaining solvent is heated to 40Â°C. or above and added to the hot wax solution. Any procedure can be used that will bring the wax into solution at a final temperature near 60Â°C. This mixture is then added slowly to the water slurry of silica and clay with rapid agitation. The emulsion forms easily. After all of the solvent solution has been added, agitation is continued, while the emulsion is cooled to room temperature. The product is then ready for packaging. An impeller-type mixer is used. This represents the 28% of solids to be added to 72% of mineral spirits. In preparing paste wax, using these formulae, it is suggested that the temperature of the wax base is held at approximately 165Â°F. and about one fifth of the naphtha at 135Â°F. is mixed with the wax. The remainder of the naphtha should be at about 90Â°F. The wax-naphtha mixture should be poured into final containers at as low as 110Â°F. Formula 2 should be poured near 120Â°F. In order to obtain the best results with each formulation, the temperatures of the two portions of naphtha should be adjusted to provide a consistency for immediate pouring which will cause a solid wax film to form on the surface about 6 minutes after the pouring. "Estawax"	10 Paraffin Wax (138Â°F. AMP)	10 Stoddard Solvent	80 Heat the solvent to 180Â°F. and add the molten waxes. Stir until a clear solution is obtained. Cool the solution to 160Â°F. and pour into containers. Dissolve the oleic acid in the oils and stir in the amine. Stir for about 5 minutes. If the mixture is not clear, add oleic acid, a little at a time, until clarity is attained. Add the oil solution to the water, with vigorous stirring, to form a creamy, stable emulsion. The clear oil solution can be marketed with directions to mix it with an equal amount of water before use, pointing out that it can be stored as an oil to be mixed with water when desired. The addition of 0.07 to 1.00 parts by weight of a 10% aqueous solution of "Cellosize" hydroxyethyl cellulose WSLH to these emulsions assures stability over a longer period of time. Oil-Soluble Dye heat the solvent to 180Â°F. and add the molten waxes. Stir until a clear solution is obtained. If a dye is used, add it while stirring. Cool to 160Â°F. and pour into containers. The waxes are dissolved in the solvents at 170Â°F. The blend is then cooled to 140Â°F. and poured. Disperse the pigment and bentonite in one half of the water. Dissolve the soap, glue, and preservative in the remainder of the water, hot. Add this solution to the pigment slurry and mix thoroughly. The designations microcrystalline and amorphous waxes were long used synonymously, although the first is more accurate. These waxes differ from refined paraffin wax in the size and structure of crystals, and in that they are tougher, more flexible, and have a higher tensile strength and melting point. They are also more adhesive and less lustrous and greasy. They bind solvents, oils, etc., much better than paraffin wax does and thus prevent their sweating-out. High penetration value and/or high refractive index indicate flexibility. Waxes of high penetration value generally have more tack." Flexibility is not a function of melting point. Oil content influences flexibility only to a limited degree. Both paraffin and microcrystalline waxes are separated from crude petroleum, but the process of manufacture and the resulting products are quite different. As crude petroleum is subjected to distillation by heating in a still at atmospheric pressure, the following products are removed in the order of their increasing boiling points: light petroleum gases, gasoline, naphtha, kerosene, gas oil, paraffin wax distillate, light neutral lubricating-oil fractions, and a residue in the still that will not distill overhead at atmospheric pressure without decomposition. Paraffin wax is separated from the paraffin-wax distillate by a relatively simple process, while the microcrystalline wax, which cannot be distilled without decomposition, is separated by a complex series of solvent separations from the residue remaining in the still. Paraffin wax, which has very little affinity for oil, is separated from the paraffin-wax distillate by cooling and filtering in a common plate-and- frame filter press where the wax is retained on canvas filter leaves and the distillate oil passes through the canvas and is removed. Oil remaining in the wax filter cake is removed by a sweating process which involves casting the wax in thin sheets and gradually raising the temperature to a point slightly below the melting point of the wax. In this process, the remaining oil runs out of the wax sheet leaving a paraffin wax, which usually contains less than 0.5% oil. Microcrystalline wax is present in the residual fraction from the still along with heavy residual lubricating oil and asphalt. Asphalt must be removed from the residue by conventional sulfuric acid treatment or one of the newer selective solvent processes before the wax can be separated. The microcrystalline wax is then removed as crude petrolatum from the residual lubricating oil by any one of several dewaxing processes, which involve dilution with an organic solvent, chilling at 20-40Â°F., and separation of the crude petrolatum at high-speed centrifuges. Microcrystalline wax has a great affinity for oil and thus the crude petrolatum still contains 40-70% oil. Therefore, it is then mixed with another portion of organic solvent, usually a different solvent from the one used in the initial dewaxing step, and heated to dissolve the wax and oil. The blend is then cooled to precipitate the wax, which is separated from the oil and solvent on a filter. The solvent used for deoiling microcrystalline wax must be polar, whereas for deoiling paraffin wax other types of solvent may also be used. Since the microcrystalline wax holds oil very strongly, the last solvent step is usually repeated to give a wax with lower oil content. The oil content of the microcrystalline waxes varies with the grade of wax but is usually 2-12% as contrasted with 0.5% in paraffin wax. Chemically, both paraffin and microcrystalline waxes consist of saturated hydrocarbon. Paraffin and microcrystalline waxes are both long-chain compounds but microcrystalline waxes have much higher molecular weights. The common commercial paraffin waxes have molecular weights of 360-420, which means that the average molecule in these hydrocarbons contains 26-30 carbon atoms. The molecular weight of high-melting point paraffins may run as high as 600. The molecular weight of commercial microcrystalline waxes is 580-700, that is, the average molecule contains 41-50 carbon atoms. This molecular weight difference accounts for the fact that the paraffin waxes can be distilled at atmospheric pressure while the microcrystalline waxes decompose when distillation is attempted. Extensive X-ray diffraction work has indicated differences in the chemical structure of the paraffin and microcrystalline wax molecules in addition to their molecular weight. Paraffin waxes have been found to consist mainly of straight chain molecules. In some paraffin waxes a very small quantity of aromatic hydrocarbons may also be present. The microcrystalline waxes contain some straight-chain molecules, but a large proportion of branched-chain molecules. The branched chains in the microcrystalline waxes are probably located at random along the carbon chain while in paraffin wax; they are near the end of the chain. There are indications that microcrystalline wax also contains a much higher concentration of ring-type compounds than paraffin wax. Microscopic examination of paraffin and microcrystalline wax shows a striking difference. Paraffin wax has large, well-formed crystals both when crystallized from the melted wax and from solvents. Microcrystalline wax forms small irregular crystals from the melted wax, but no well-formed crystals of any size from solvents. It can be seen that in the highest-boiling fraction, the malcrystalline and needle types are present in a greater total amount than the plate type. These waxes yield a much lower melting point for a given boiling point. For this reason, they are usually almost completely lost in paraffin refining. These types represent Buchler and Graves' "soft wax" and they also constitute the bulk of microcrystalline or amorphous waxes obtained from higher-boiling distillate and residues. A new method of fractionating waxes, called zone precipitation, separates crystalline from non-crystalline petroleum waxes through differences in solubility when a solution of the waxes is cooled. The following tables indicate the possibilities of this method. The wax used was a microcrystalline wax (m.p. 175Â°F) from a North Louisiana crude. The direction of motion of the dissolved waxes was characteristics. 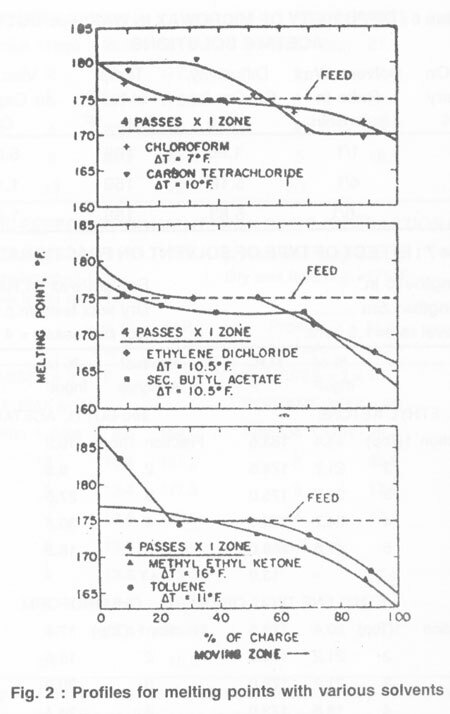 Components of low melting point and high solubility moved towards the hot zone; those of high melting point and low solubility moved in the opposite direction. 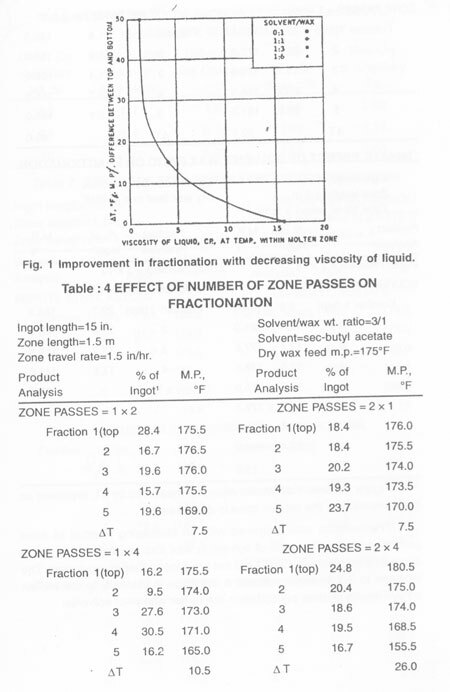 Figure 1 shows that fractionation, as measured by?T, improved as liquid viscosity in the molten zone is decreased. 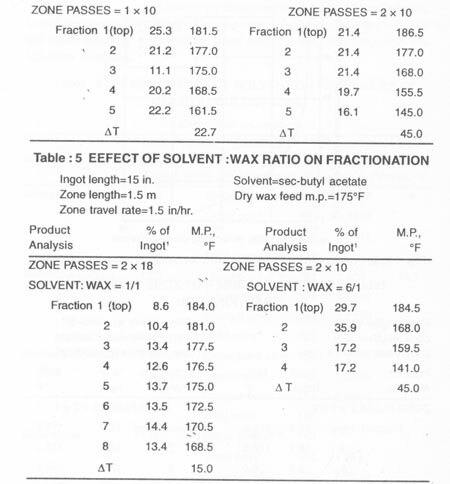 Fractionation also improved with an increasing number of zone passes, and when the ratio of solvent to wax was increased from 1:1 to 3:1; but further increase to 6:1 did not produce further improvement. The increase to 3:1, however caused a decrease in viscosity in the molten zone. Results in zone precipitation are better with poor solvents. The melting point of commercial paraffin waxes is, in general, much lower than that of microcrystalline waxes. Paraffin waxes usually melt at 126 - 134Â°F, and microcrystalline waxes at 145 - 195Â°F. The melting point, however, is not sufficient for distinguishing them because paraffin waxes melting up to 170Â°F are available, and microcrystalline waxes have been prepared with a melting point as low as 130Â°F. Paraffin waxes are brittle but microcrystalline waxes are tough, resisting fracture. Most grades of microcrystalline wax are plastic and tend to flow under compression, whereas all grades of paraffin wax will shatter under compression. Oil added to most grades of microcrystalline wax will increase its plasticity. Addition of oil to a paraffin wax will yield not a plastic product, but one with greatly reduced strength which tends to crumble when handled. Paraffin wax is transparent; microcrystalline wax is opalescent. Various grades may be white, brown or black in color. Films of paraffin and microcrystalline waxes of the same color and thickness transmit different amounts of light and thus films of paraffin wax appear more transparent than those of microcrystalline-wax films. Paraffin wax forms a stronger gel in turpentine than does microcrystalline wax in the same ratio of melting point and solvent. If a glass rod is dipped into a solution containing a precipitate of microcrystalline wax in mineral oil and is withdrawn, the solution will drain away, leaving only a think layer of oil on the rod. If the solution contains a precipitate of paraffin wax, crystals will remain on the rod, because the surface tension of the crystals of paraffin wax is less than that of the oil, whereas that of the microcrystalline-wax crystals is greater than that of the oil. Paraffin wax contracts to a greater extent when passing from the liquid state to the solid state than do microcrystalline waxes. A test to differentiate between paraffin and microcrystalline waxes has been based on this behavior. The Saybolt Universal viscosity at 210Â°F for microcrystalline waxes is usually 70 - 100 seconds; that of paraffin wax, 40 - 50 seconds. The refractive index at 212Â°. for paraffin waxes is usually 1.430-1.433 and for microcrystalline waxes, 1,435-1445. The tensile strength of paraffin wax of very low oil content, (0.1% or less) is high, but the addition of even 0.5-1% oil will greatly reduce the tensile strength (up to 50%). The reduction of tensile strength of microcrystalline wax with the same addition of oil will be about 5%. This phenomenon is due to the fact that oil weakens the structure of paraffin wax, but it is so readily absorbed by microcrystalline waxes that a more plastic product results which imparts plastic flow under tensile stress. The extensibility is much greater with microcrystalline wax than with paraffin wax. Addition of oil will increase the extensibility of most microcrystalline waxes, but does not affect that of paraffin wax. Cast in small rods, most microcrystalline waxes will bend without breaking at temperatures considerably below their melting point. Paraffin waxes cast in the same way usually break at or near their melting point. Microcrystalline waxes are compatible in all proportions with other mineral waxes, most vegetable waxes, and resins. This property has made them valuable as agents for increasing melting point and hardness, and for decreasing blocking, tack, sweating, and other undesirable qualities in wax blends. The adhesion test measures the force required to tear apart a test specimen prepared by laminating a square of unwaxed cellophane on either side of a square of waxed cellophane. An unlaminated edge of each of the outer cellophane squares is placed in a clamp on a machine similar to that used for measuring the strength of paper. One clamp is slowly drawn away from the other by a motor-driven screw until the squares have been separated. A lever attached to the stationary clamp moves along a scale and indicates the relative amount of force required to tear that laminated squares apart. The higher the adhesive strength of the wax, the higher is the test value obtained. In this test, a sample of the wax is melted, and five droplets (6-8 mm in diameter) are placed on a filter paper (Whatman No.1). When the droplets have solidified, the paper is placed in an oven at 130.F.for 24 hours. The average value (in millimeters) obtained by subtracting the diameter of each droplet from the diameter of the oil ring that surrounds it is recorded as the bleeding number. The less the tendency of the wax to bleed, the lower is the number obtained. 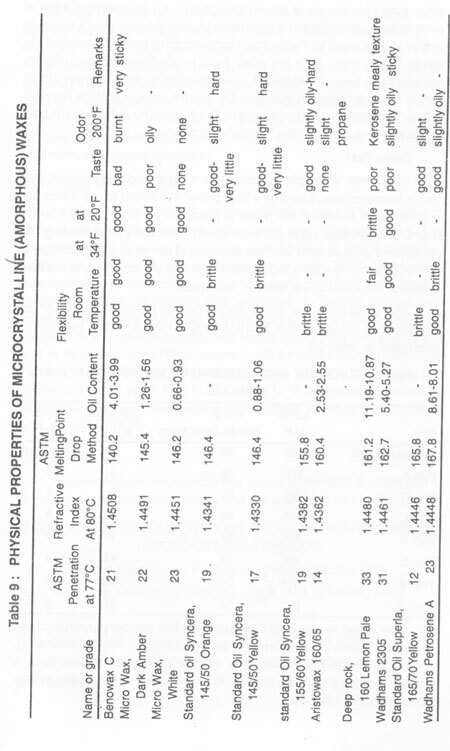 The adhesion and bleed properties of Multiwax ML 445Â° as compared to those of other microcrystalline waxes on the market are presented in Table 29. The bleed values might indicate that low needle-penetration has been overstressed as a criterion of the suitability of a wax for laminating. It has been held that waxes with relatively high penetration have a greater tendency to strike through the laminating paper. These values do not support this theory. It may be noted from the preceding table that some waxes have high adhesion at the expense of their bleed characteristics (Wax E, for example). Others have good bleed properties, but low adhesion (Wax A, for example). Obviously, the most suitable laminating wax would be one that has a combination of relatively high adhesion and relatively low bleed characteristics. Such a Combination which depends on the proper selection of raw materials and the manufacturing process is represented in Multiwax ML 445, a wax which is used in increasing quantities as a paper laminant. In many applications of microcrystalline waxes, it is essential to know their miscibility with various resins and other additives. 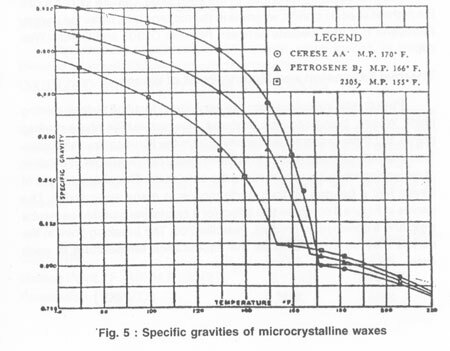 The solubilities of a number of products in Petrosene C (microcrystalline wax) were determined on a semiquantitative basis. Table :11 presents data indicating the solubility-temperature relationship for these mixtures. In all cases, 10% of additive was employed so that no attempt was made to determine the maximum solubility. It is expected that the solubility of any resin in paraffin wax will be greater than in Petrosene C and in other microcrystalline waxes it will be of the same order as in Petrosene C. Table : 11 is divided into two sections, one listing the additives soluble up to 10% in Petrosene C. at all temperatures above its melting point and the second listing those which are insoluble or only partially soluble. The solubility of microcrystalline waxes in solvents is a function of the solvent used, the temperature and the amount of wax in the solvent. Percentages Used: Petrosene C-90%; Additive-10%. 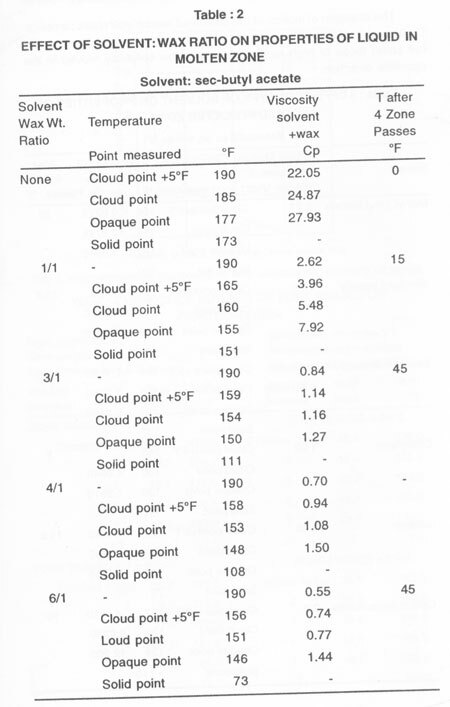 The cloud point is a simple and accurate means of expressing the solubility of waxes in solvents. Above the temperature of the cloud point the wax is completely soluble, whereas at the cloud point and be low the cloudiness indicates at least partial insolubility. To determine cloud points, the wax was weighed in the solid state and placed in a 250 ml flask. 100 ml of the solvent was then measured into the flask and the flask set up under a reflux condenser to eliminate any possible loss of solvent. Heat was then applied with the burner until the wax was all in solution. The solution was then allowed to cool gradually with constant, gentle swirling and the temperature was noted when the first cloud appeared in the solution. The temperature was taken on a thermometer inserted through the stopper in the flask and extending into the solution. After the first temperature of cloud was noted the solution was reheated, again allowed to cool, and a second temperature was noted. This operation was repeated until three check readings were obtained. The higher the melting point of the wax, the lower its solubility in any given solvent. When microcrystalline waxes solidity, they contract and their specific gravity changes, this has a bearing on their performance in many applications. In the impregnation of electrical or other equipment, for example, where voids are filled with molten wax, it is frequently essential to determine how much contraction will occur on solidification so that adjustments may be made to avoid loss in waterproofing value. In addition, it may be necessary to determine what volume a given quantity of solid wax will occupy when melted and heated to a definite temperature. 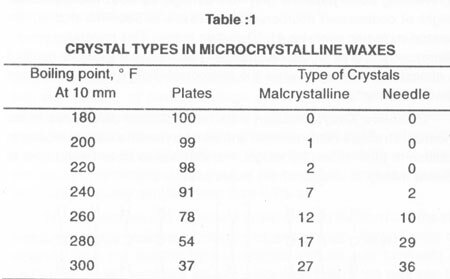 In order to obtain this information, representative samples of microcrystalline waxes were held at definite temperatures and their specific gravities measured. The data so obtained are given in Figure:5. Cerese Wax AA, Petrosene B, and Product 2305 were tested. These are the intermediate colored waxes in each of the three series. Since the other waxes differ from these only in color, their specific gravities may be considered comparable. Due to slight variations from batch to batch, other samples of any wax will probably show slightly different values from the figures noted. Based on the available data, however, these variations are not expected to exceed 0.005, except for samples of widely different melting points, in which case, the greatest divergence will be at temperatures near the melting point. It is interesting to note that, in the solid state, Cerese Wax AA has the highest specific gravity, whereas in the molten state, it has the lowest. Petrosene B is intermediate between Petrolite C2305 and Cerese Wax AA. Pure crystalline substances are very often identified by their melting point. Waxes, being complex mixtures, doe not exhibit sharp melting points, but there is a gradual transition from the liquid to the solid state. This gradual softening results in an abnormally high apparent coefficient of expansion while the wax is still in the solid state. This characteristic of waxes has a bearing on their performance in many applications. 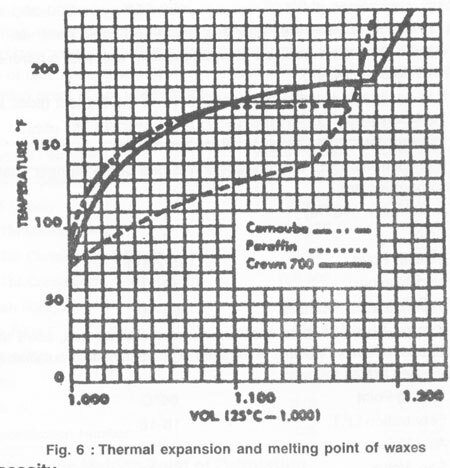 The curves in Figure 6 compare this effect for a crystalline paraffin, carnauba wax, and a commercial product, Petrolite 700. The breaking point in the curves may be interpreted as the liquefication temperature in each case. The viscosity of microcrystalline waxes, when melted, is greatly lowered by small additions of ordinary paraffin wax. Oxidized microcrystalline waxes are prepared from the residue on the bottom of the tanks in petroleum refining. This is extracted with methyl ethyl ketone, chilled, filtered, and refined. It is then oxidized in air in the presence of a catalyst, often cobalt or manganese soaps. Color, NPA 3 Max. 3 Max. Penetration (100/5/77) 2 Max. 2 Max. Uses: Phonograph-record component; paste and liquid polishes. Cardis One is an oxidized microcrystalline wax with a hardness of 1-2 ASTM penetration). It is easily emulsifiable and yields films of the highest gloss and wear resistance. Its emulsions dry to highly scuff-resistant films. Emulsifiable waxes result from the oxidation of high-molecular-weight microcrystalline waxes. This oxidation forms esters and fatty acids, which impart saponifiability. The emulsifiable waxes are widely used in the manufacture of polishes. They are also used to reduce substantially the amount of vegetable waxes. In many cases they have displaced vegetable wax entirely. Petrolatum wax (mineral jelly) consists of a natural mixture of microcrystalline wax plus 10% of mineral oil, Freed from most of its liquid and semi-liquid hydrocarbons, petrolatum yields an amorphous, white, translucent, plastic wax. It is commercially available under many names. Its plastic and noncrystalline properties make it very useful. It also has good oil-holding capacity and prevents leakage or sweating out of oils. Thus, it can replace ceresin and ozokerite, where their low melting point is not undesirable. The maximum increase in melting point of petrolatum is usually obtained by adding 3-5%, of a variety of waxes. As 5% white beeswax increases the melting point 2Â°, 10% increases it 5Â°, and 20% increase it 9Â°. Obviously, the optimum amount is somewhere between 10 and 20% beeswax. An addition of 5% yellow beeswax increases the melting point 2Â°, 10% increases it 10Â°and 20% increases it 17Â°. That is, yellow beeswax is better than white beeswax for increasing the melting point of petrolatum. Microcrystalline waxes are used for the laminating of paper, cloth, etc. ; for water proofing of papers, boxboard, textiles, wood, etc. ; potting compounds for condensers; electric wire insulation; binder for pipe coverings; finishes for leather; polishes for floors, furniture, skis, leather; rust prevention; compounding of rubber; pattern making (sheets and fillets); cosmetics, printing inks, lubricants, records. They are steadily increasing in value and application in the packaging industry. Microcrystalline waxes are widely used for lining drums. The application of the wax is quite simple. The drum is heated to a temperature that will give the thickness desired. Heated, molten wax is poured into the bung, the opening is closed, and the drum is rolled in such a way as to bring the molten wax into contact with the entire inner surface. The excess is then poured out or removed by other means. Any desired thickness of film can be evenly distributed over the inner surface, with considerable reinforcement at the corners. The quantity required will vary from 0.5 to 3 or 4 lb, depending on the desired thickness. Adhesion will be excellent with the proper wax, if the interior of the drum is absolutely dry. Wood or steel vats can be lined with wax in a number of ways. The surface to be coated must be absolutely dry and preferably warm. The wax may then be applied by trowelling (hot, plastic), flushing, mopping, or spraying. In the case of mopping or trowelling, it is good precaution to apply a preliminary thin spray coat and then the second coat while the surface is still warm enough to insure good adhesion. Diameter and Height. Ft Volumes gal coatings Thickness, in. Quantity of Wax. Lb. These are approximate figures, but they will serve as guides and multipliers. They are for vertical tanks, with only the bottoms and vertical sides waxed. Several testing methods are required for exploring commercial applications and many of the methods must yet be standardized. 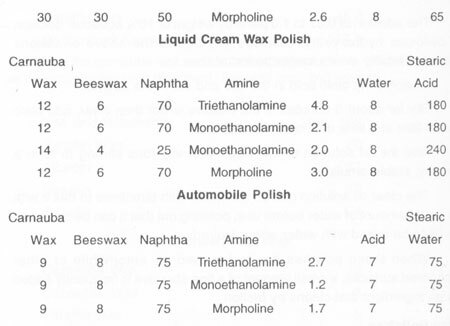 The properties of five additional commercial waxes without the addition of oil, are shown in Table 6. They may be of assistance to commercial users of wax and may help in the formulating of specifications and testing methods. Blocking, hardness, and tensile strength of microcrystalline waxes are adversely affected by increased content of branched-chain paraffins. Sealing strength and flexibility are improved by increased content of cyclic and branched paraffins. Small amounts of Paraflow inhibit excessive growth of crystal, and change the shape from the needle type to small equiaxial grains of uniform size. Microcrystalline waxes mixed with 5-10 percent polypropylene at 140Â°C give products of tensile strength and better flexibility and adhesion. Sealing strength is improved and brittle point is lowered in microcrystalline wax by addition of 2-8.5% of hydrogenated phenanthrenes and chrysenes. Bareco microcrystalline waxes are featured by high melting points, excellent heat-sealing characteristics, plasticity over a wide temperature range, hardness, high gloss, and a wide range of colors. Bareco microcrystalline waxes are classified into four groups: (1) hard, (2) plastic, (3) emulsifiable and (4) synthetic. The Bareco hard microcrystalline wax group includes the hardest and highest-melting-point petroleum-derived waxes available. Product Melting Pt. Minimum Â°F Penetration 77 Â°F Maximum Color N.P.A. Maximum Acid No. Sap. No. Bareco hard waxes are used in polishes, printing ink, phonograph records, carbon paper, paper coating, sizings, protective coatings. Bareco plastic microcrystalline waxes are characterized by ductility, high sealing strength, freedom from odor and taste, low temperature flexibility and strong resistance to moisture-vapor transmission. The Bareco plastic microcrystalline waxes are used for lamination, packaging, overwraps, water-proofing, cosmetics, sealing compounds, rust preventives. Bareco emulsifiable waxes result from the oxidation of high-molecular-weight microcrystalline waxes. This oxidation forms esters and fatty acids, which impart saponifiability. The Bareco emulsifiable waxes are used in floor, furniture and leather polishes, leather dressings, self-polishing compounds. Bareco microcrystalline waxes are combined or reacted with various resins or other chemical materials to incorporate characteristics not attainable in the waxes alone. Many of the Bareco synthetic waxes are tougher, more flexible and higher melting than carnauba. Certain of the Bareco synthetics are extremely hard and have excellent molding characteristics without being brittle. Bareco synthetic waxes are used in polishes, carbon paper, casting wax. 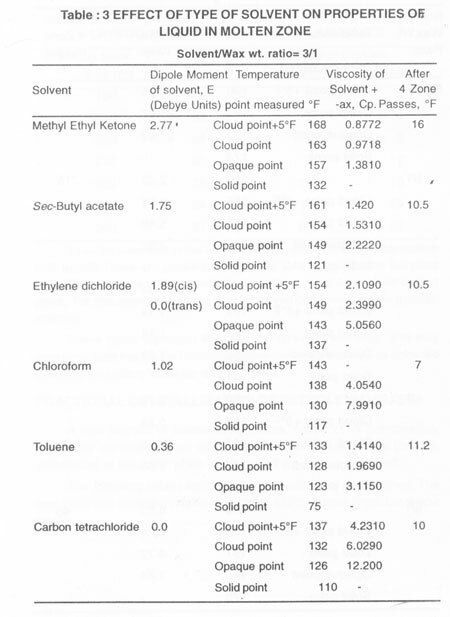 The following table gives the solubility of Be Square Waxes in terms of cloud point for various weights of each wax in 100ml of solvent. Chlorox 174 5g will not dissolve at b.p. 184 5g will not dissolve at b.p. Aniline 260 5g will not dissolve at b.p. 264 5g will not dissolve at b.p. Ethyl Alcohol 1g will not dissolve at b.p. 1g will not dissolve at b.p. Isopropyl Alcohol 1 g will not dissolve at b.p. 1g will not dissolve at b.p. Furfural 1g will not dissolve at b.p. 1g will not dissolve at b.p. Phenol 1g will not dissolve at b.p. 1g will not dissolve at b.p. b.p.Cellosolve 1g will not dissolve at b.p. 1g willnot dissolve at b.p. D445 160Â°F 45/60 Dark Olive 90 min. D835 155Â°F 60/80 Dark Olive 90 min. These waxes are used for coating or laminating, their application being restricted only by the special hardness or melting-point requirements of isolated uses. They are recommended for all applications requiring inert, chemical-resistant, durable, adhesive, flexible coatings or impregnants. Color, ASTM 3-4 dil. 2-3 2 max.